As technology evolves, you know the importance of upgrades to computer systems, devices and other electronics in order to stay ahead of the competition. But, as technology advances faster than electronics break down, as a company, you’re tasked with finding a solution to the following question: What do I do with all these electronics I no longer need? Though it may be tempting to toss the electronics in the trash bin behind your office, that short-sighted decision can lead to long-term ramifications, from detrimental environmental impacts to costly fines. Whether it’s old gadgets or entire rooms of electronics no longer needed, it’s important to know which pieces you can dispose of yourself in an outside trash or recycling receptacle, and which require proper electronic waste disposal methods that meet state and federal regulations. Zinc plating, often found in steel production parts, is generally a harmless substance. Aluminum is found in most electronic goods and is free of toxic properties. Copper and gold, well-known metals, are regularly used in computer parts and do not post as much of a threat to the environment as other materials. While these may be harmless, it makes sense to recycle them. Sometimes, you can even get money for these metals, depending on their form and quantity. Problems arise when these pieces are accompanied by materials that pose contamination risks, which is outlined in the next section. Several other components of electronic equipment, from plastic to glass, can be recycled as well by taking them to county or private recycling facilities. Modern electronics depend on a variety of interacting chemicals and metals to function. Many of these substances pose dangers to humans and animals, but the devices are designed to keep users safe from exposure. Sulfur found in certain types of batteries can cause permanent damage to the kidney and heart. Mercury found in light bulbs and computer monitors can cause muscle weakness, impaired physical development and memory problems. Beryllium oxide, found in computer towers, can cause chronic lung diseases. In California, the term “e-waste” generally refers to consumer and business electronic equipment when it is no longer needed or available to use. It’s important to note that there is no clear definition for e-waste, and that e-waste falls under separate regulations than universal waste. However, if you can plug it in or it includes a circuit board or chip, it is most likely considered e-waste. That’s because many of these items contain the materials above, or other heavy metals such as cadmium, chromium and lead. Other electronics: Printers, scanners, laptops, keyboards, CD and MP3 players, copiers, telephones, lamps, clocks, flashlights, circuit boards, camcorders, fax machines, cell phones, hair dryers, irons and blenders. 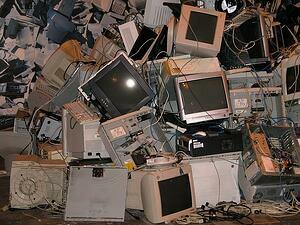 In the United States, each person trashes about 44 pounds of electronic waste per year. That’s according to a 2016 study that showed just how easy it is to discard waste that can have devastating consequences on the environment. Reduce e-waste through good maintenance and procurement. Reuse by donating or selling functioning equipment. Recycle any products that cannot be used again, such as through repairs. There also are several organizations and companies that will manage the recycling of your electronics. Drop-off locations or companies that pick up your equipment make safe disposal of these electronics safe and smart. Important reminder: Many electronic products store sensitive data or personal information. Before disposing or recycling equipment, remove any sensitive information from its memory. Deleting files from a computer’s desktop, for example, does not automatically wipe a computer’s memory. If you need assistance, reach out to a software store or other professional who can assist with cleaning off a drive or removing software. Separating safe electronic components from their toxic counterparts can be extremely difficult without proper training. Attempts at this type of sorting without proper preparation also may prove just as dangerous as tossing these parts in the garbage. You also may have inexperienced employees unaware of the consequences of discarding e-waste illegally. Companies like Costco, Telecom and Walgreens have not been immune to employee negligence and substantial fines from government regulators. Understanding what e-waste you can and cannot throw away is important not only for meeting environmental regulations, but for your bottom line and public image as well. Working with a trained e-waste removal team can take these tough decisions out of the hands of your employees, and can safely separate and recycle e-waste for you.